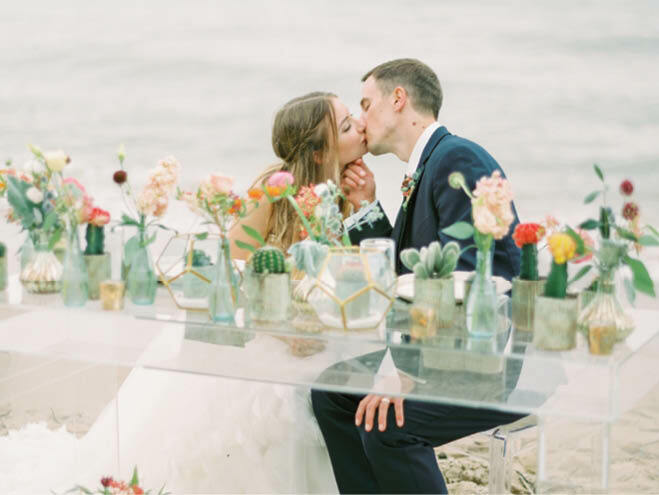 With one Great Lake to our east and thousands more dotting our beloved state, take advantage of Wisconsin’s miles of shoreline for a brilliant beachside wedding. Don’t be shy with color and texture. 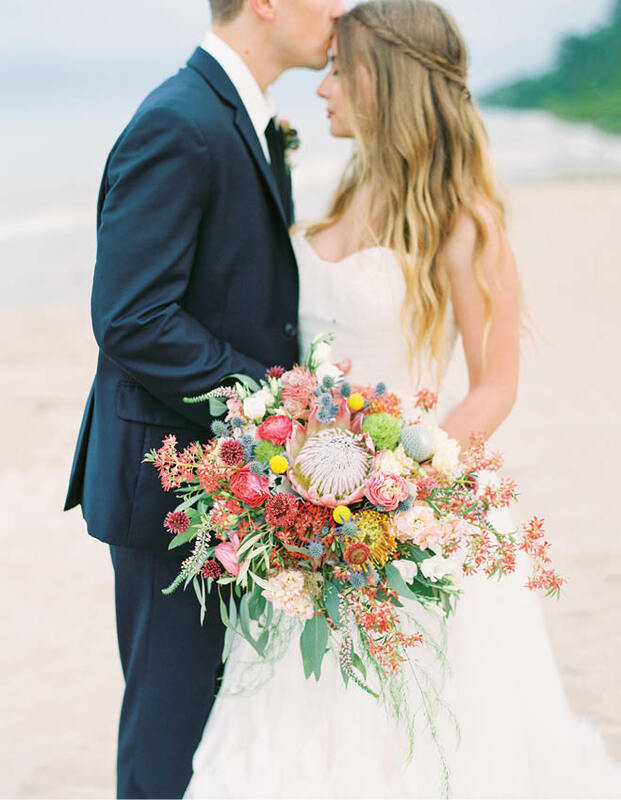 This loose, sumptuous bouquet embodies the easy vibe of a relaxed day—for bride, groom and guests alike. Table for two, please. 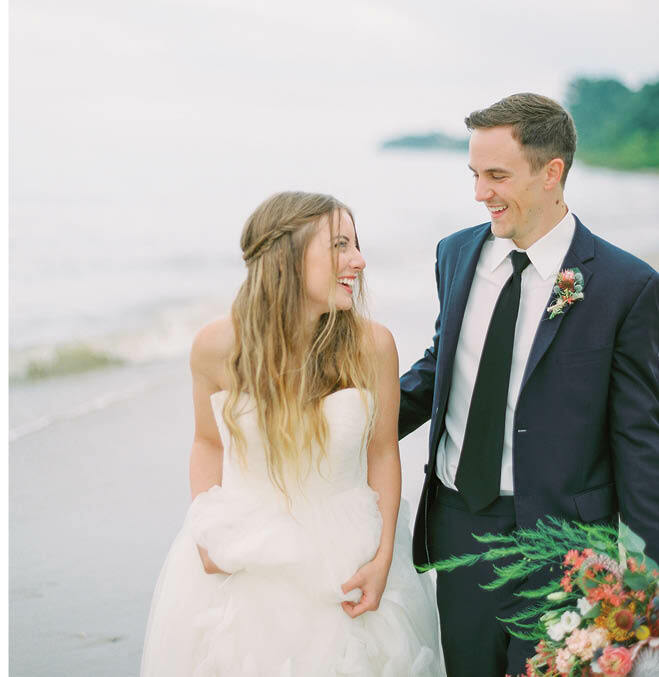 Sash&bow owner/planner Alliey Kline-Weichelt went for a clean look to highlight the Lake Michigan setting. 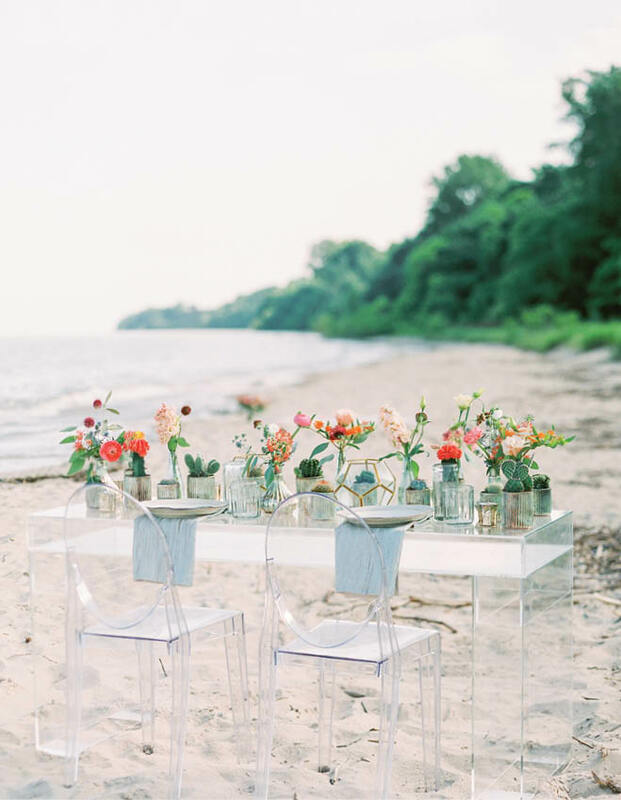 The sleek acrylic table and chairs do the trick, allowing the vibrant florals to pop and the shore to shine. For a look he’ll love, keep it traditional. 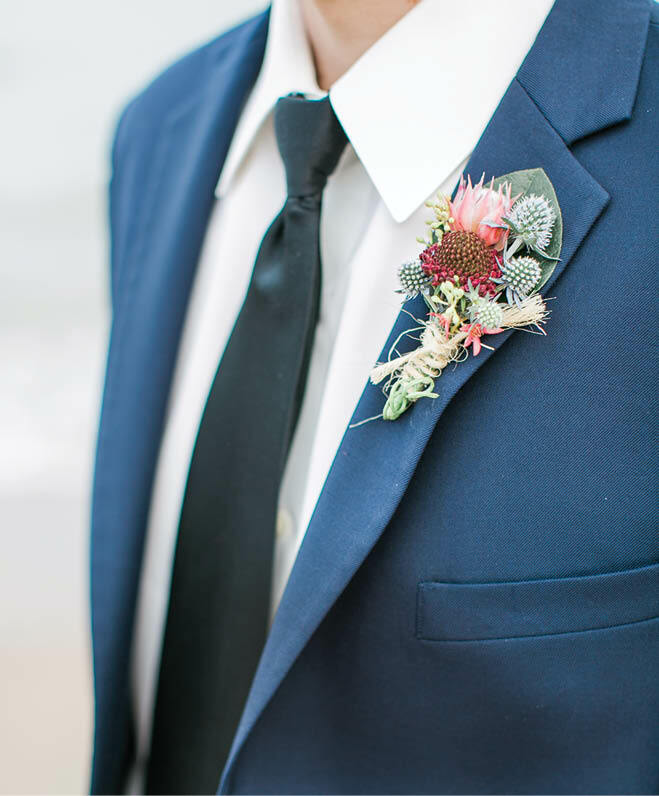 A navy suit—clean, classic, yet contemporary—complements waterside hues, while a textured boutonniere adds an elegant element of surprise. 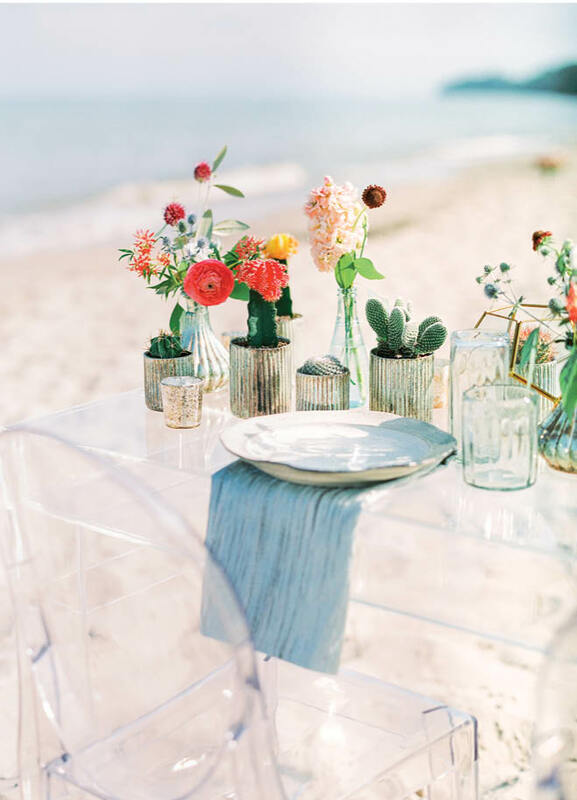 Clean, clear lines of the table and chairs make the landscape the star, while textured plates and glassware, along with linen napkins, make for a perfect tablescape. The bold and the beautiful, floral edition. Buds ’n Bloom Design Studio, one of Green Bay’s premier florists, arranged a prism of flowers and greens (ranunculus, queen protea, billy ball, seeded eucalyptus and blue thistle, to name a few) in a bouquet you won’t want to put down. Nothing fussy here: Pair beachy waves and natural makeup with an ethereal, easy-to-move-in dress, so you can take a stroll on the sand or break it down on the dance floor, depending on your whim. “Every bride deserves to be comfortable on her wedding day,” says Kline-Weichelt. 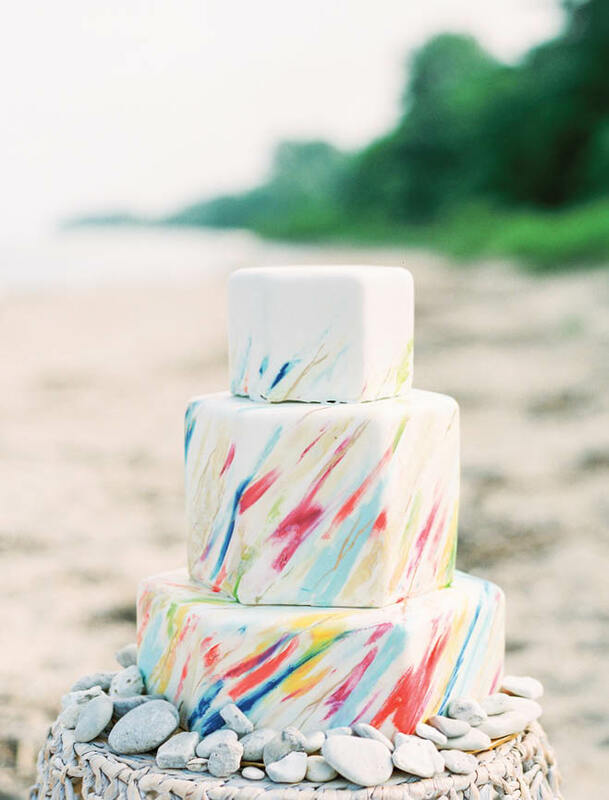 Green Bay’s Monzu Bakery hand-painted colorful wisps on this hexagonal cake, echoing gentle waves. Water-smoothed rocks add a purely natural element, grounding the coastal theme. Save us a slice, will you? 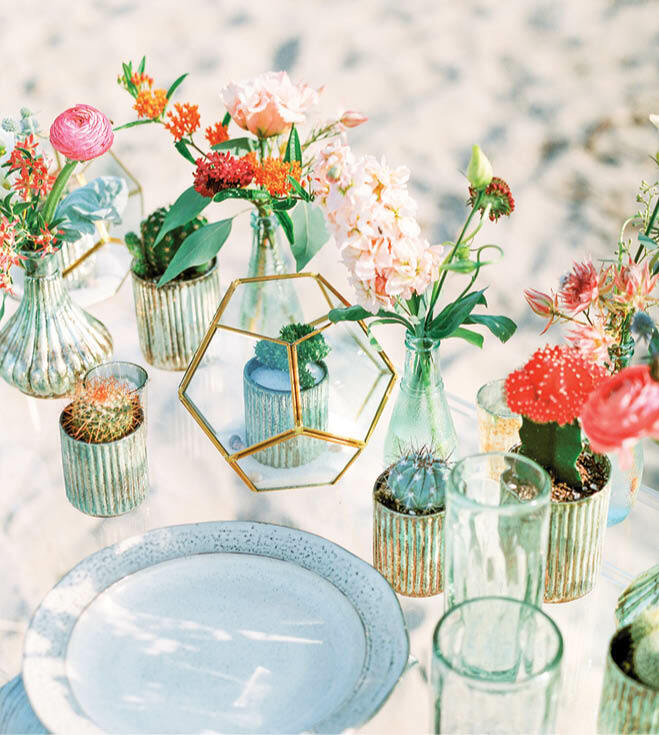 Instead of one elaborate centerpiece, scatter miniature vessels—here in shades of teal and gold—for a lively look. 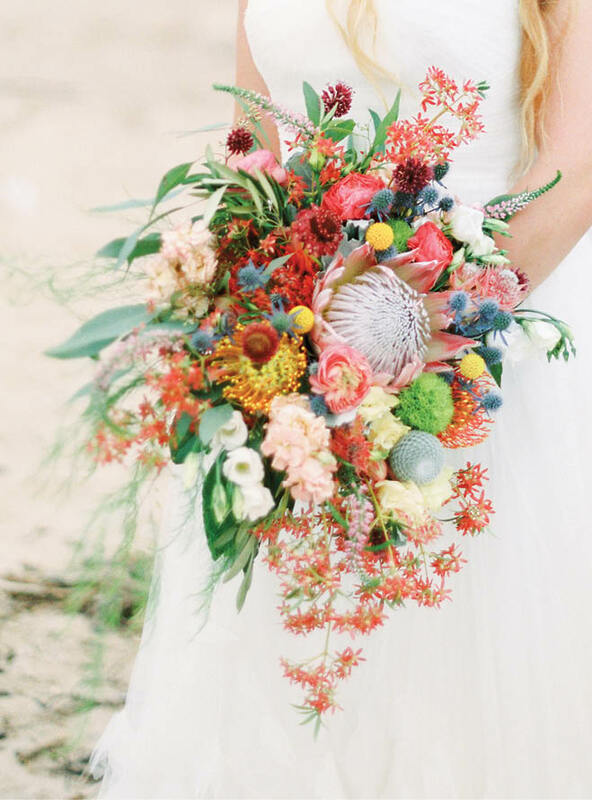 Re-create this scene with tiny cacti and freshly cut blooms like pincushion protea, butterfly weed, veronica and more. Very important: Amid the hubbub of the big day, don’t forget to steal a kiss or two—or 10.